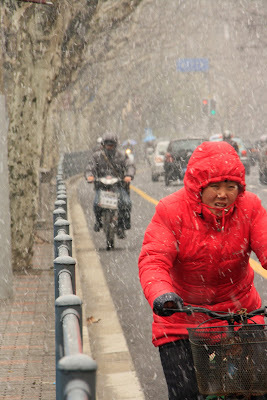 Life on Nanchang Lu: I said Sun, not Snow! I said Sun, not Snow! Well, spring is getting further and further away. Quite unexpectedly today it snowed, all day. Big, fat, soft flakes drifting down and settling in my hair. Lovely when strolling, much less lovely on a bicycle without gloves on.